All the bye weeks are over and the push for the playoffs is on as the NFL enters Week 14 of the 2014 season. The first tilt on the NFL Confidence Pool Week 14 sheet is a “Thursday Night Football” match-up between the Dallas Cowboys and the Chicago Bears. 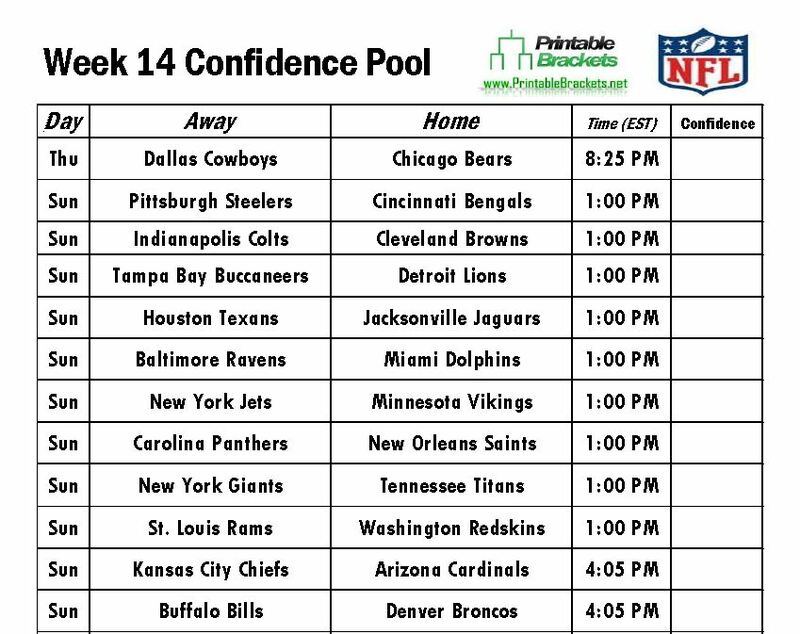 The season is in the home stretch and you can download and print the NFL Confidence Pool Week 14 sheet here. You can also get a Week 14 Pick Em sheet. Both printable pool tools are free from PrintableBrackets.net. The Cowboys and Bears will be meeting in primetime in Week 14 for the second consecutive year. In 2013, the Bears crushed the Cowboys, 45-28, in Chicago. The 2014 matchup marks the 22nd all-time meeting between the teams. The Cowboys hold a 12-9 edge in the all-time series, but Chicago has won the last three encounters. Meanwhile, Sunday’s early action on the NFL Confidence Pool Week 14 sheet is headlined by a meeting between the Carolina Panthers and the New Orleans Saints at the Superdome. Other early games include the Indianapolis Colts at the Cleveland Browns, the Pittsburgh Steelers at the Cincinnati Bengals, and the New York Giants against the Tennessee Titans. An NFC showdown between the Seattle Seahawks and the Philadelphia Eagles highlights the late Sunday action on the NFL Confidence Pool Week 14 sheet. The San Francisco 49ers will in action late Sunday against the Bay Area-rival Oakland Raiders, while the Arizona Cardinals will host the Kansas City Chiefs. The “Sunday Night Football” affair pits Tom Brady and the New England Patriots against Philip Rivers and the San Diego Chargers. The Atlanta Falcons will face the Green Bay Packers on “Monday Night Football” in the final game on the NFL Confidence Pool Week 14 sheet.